The vengeance of God was swift in striking the blasphemous Henry Creesy. The night after his sacrilege committed during the burning of the Ursuline Convent, he entered Bite Tavern in Newburyport, not far from Charlestown. Drunk and drenched with rain, he ordered one whiskey, then another, and another. His behavior became more and more erratic. Finally, he drew his knife and threatened those around him. As the barkeeper and several others moved to subdue him, he drew the knife to his own throat, severing his windpipe. The cut was so violent the head scarcely remained connected to his body. The next day, a committee of respected citizens was formed to investigate the riot. The nuns were cleared of any illicit activities, and 13 men were arrested for rioting. When the case came to trial in December, the jury convicted only one 17-year-old boy, Marvin Marcy, who was made scapegoat for the riot. The following October, the Governor also pardoned and released him. A bill to pay State compensation to the Ursuline Order failed to pass the legislature. For the Catholics of Boston and Charleston, these outcomes constituted a clear injustice, but there were no recourses for them to take. It did not escape their attention, however, that many of the persons connected with the riot suffered personal disasters. Rebecca Reed, the apostate who wrote the book about Convent life, went mad and died four years later at age 26 of tuberculosis. The Episcopalian minister who had encouraged her apostasy developed an uncontrollable facial tic and a nervous disorder that ruined his career. The daughter of selectman John Runey, who had applauded the mob by burning the Convent, also became insane shortly after the trial. The youth Marvin Marcy also went mad. Then, one year later, another dramatic fire broke out in Charlestown. 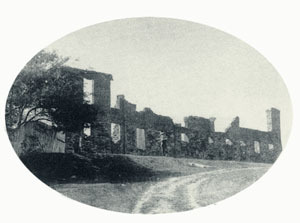 It started on August 25, 1835 and burned from 5 p.m. to 1 or 2 in the morning, almost the same period as the Convent fire. Sixty houses including two hotels and a bank were completely consumed. Catholics – and even many Protestants – believed it was God’s hand acting in response to the horrible outrage committed by that town upon the Ursuline Convent on the night of August 11, 1834. Some lessons can be learned from comparing the Charlestown public reaction to this sacrilege with the healthy reaction of the people of Riobamba, Ecuador to a similar blasphemous act. In the late 19th century the anti-clerical Liberal government of Ecuador was instigating many acts of violence against the Catholic institutions. On May 4, 1897, some Liberal troops broke into the Chapel of St. Philip’s College in Riobamba. The soldiers attacked and wounded Fr. 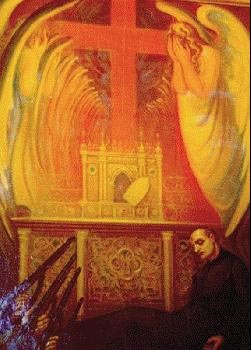 Emilio Moscoso, a Jesuit who died trying to defend the Blessed Sacrament. A soldier then opened the Tabernacle, emptied the chalice and stamped on the Sacred Hosts. The group mockingly drank spirits from the chalices, making parodies of the Mass and Holy Sacraments. The public of the entire city of Riobamba rose up in fierce outrage. In reparation for this sacrilege a new order of tertiary Franciscans, the Congregation of Franciscan Mothers of the Immaculata, was founded three years later. Its purpose was to make reparation for that sacrilege and others committed during those years of Freemason governments. Each year on May 4, Catholics of Riobamba would gather in a Mass in St. Philip’s Chapel to commemorate the martyred Jesuit and make reparation for the desecration of the Blessed Sacrament that had taken place. Such was the love and respect of the Catholic people of Riobamba for Our Lord in the Blessed Sacrament. In Charlestown, on the contrary, there was no talk of public reparation for the described crimes. Faithful Catholics, contaminated by human respect, were trying to blend and fit into the predominantly Protestant culture and were anxious not to incite more acts of violence against their persons or properties. The subservient Catholic Hierarchy did nothing, fearful of attracting more adverse attention. The sacrilege against Our Lord and the acts of terror against the undefended Ursuline Sisters, as well as the destruction of their property, became just an “unfortunate incident,” one to be forgotten as soon as possible. This is a mentality we should reject in order to acquire the true militant spirit of our Holy Mother Church. The Ursuline Convent was never rebuilt. Its ruins stood there for the next half century as a reminder of the virulent hatred against Catholics. The site was leveled in 1875 and the bricks incorporated into Boston’s Cathedral of the Holy Cross. Today, few persons even know about this terrible sacrilege that occurred, a most lamentable episode in our American Catholic History. Testimonies of Mary of Agreda's Presence in the U.S.